Office perks will include a 3,000-person capacity cafe, state-of-the-art auditorium and massive fitness center. Apple has updated its plans for its new "spaceship" corporate campus in Cupertino. Interest in the new renderings became obvious when the city's website moved at a snail's pace due to heavy traffic. Updates for the "Apple Campus 2 Project" were posted online by the Cupertino City Council Tuesday. The documents show 7 new renderings of the proposed design. The drawings show the same basic design, but with a few new details. The circular structure will have four levels of offices with over 2.8 million square feet of above ground space. The design also includes a 500,000 square feet rooftop plant area, and two levels of underground parking for the offices expected 12,000 exmployees. The buliding will be surrounded by a natural landscape including more than 6,000 trees. Other updates include additonal parking plans, a new private jogging path, and a 20,000 square foot expansion of the buildings fitness center. Former CEO Steve Jobs originally proposed the design to the city council back in June. His presentation was his final public appearance prior to his death. Jobs told biographer Walter Isaacson that he wanted "to leave a signature campus that expresses the value of the company for generations." Keeping in line with Apple's retail stores, Jobs selected a sleek office design. 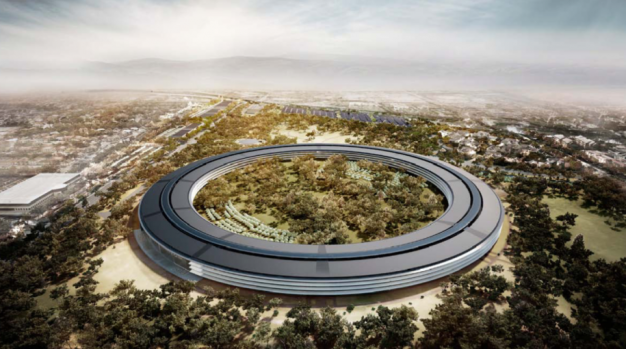 The circular structure won't have "a single straight piece of glass in the building," said Jobs. It's an odd complaint but one that people who live near Apple's new proposed Cupertino campus say needs to be addressed. The Cupertino City Council still needs to approve the plan, but Apple hopes to start construction on the project early next year. The projected completion date for the new campus is set for 2015.